The Christian highlands of Ethiopia preserve a living branch of the tradition of scribal production that would have once served all of Europe and the Mediterranean world. Due to the country's long isolation and comparatively-recent modernization, traditional scribes still produce books by hand, providing a living link to the craft practices of the past. Due to the influence of modern books and printing, the tradition is faced with extinction in the near-future, necessitating work to save traditional knowledge before it is permanently lost. This website, and its companion exhibition on Ethiopic Manuscript Production installed in the John M. Kelly Library will introduce the process, people, tools, and material involved in the Ethiopian tradition of manuscript production. It also includes links to further material, so that the interested reader may learn more, and, perhaps, even actively participate in raising awareness of and preserving the memory of this unique tradition. 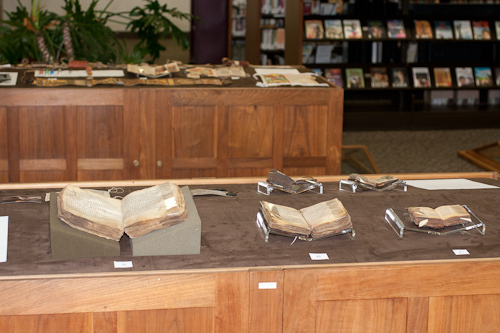 The exhibit, Ethiopic Manuscript Production is at the John M. Kelly Library at the University of St. Michael's College in the University of Toronto. It arose from the thesis research of Sean Winslow, a doctoral candidate at the Centre for Medieval Studies, and was produced under the auspices of the Collaborative Program in Book History and Print Culture, directed by Professor David Galbraith. The exhibit ended September 12th 2011. Ethiopian scribes primarily write in a language called Ge'ez, or Ethiopic; though no longer spoken, it is the scriptural and liturgical language of the Ethiopian Orthodox Tewahedo Church. A South Semitic language Ge'ez is closely related to modern Amharic and Tigrinya, more distantly to Arabic and Hebrew. The Ge'ez alphabet, called Fidel, is descended from that of the Sabeans (South Arabia, modern-day Yemen). The alphabet is used to write Amharic, Tigrinya, and some other Ethiopian languages. Some content on this website is in Ethiopic characters, and will not display properly unless you have Ethiopic rendering support. I use, and recommend, the AbyssinicaSIL font. 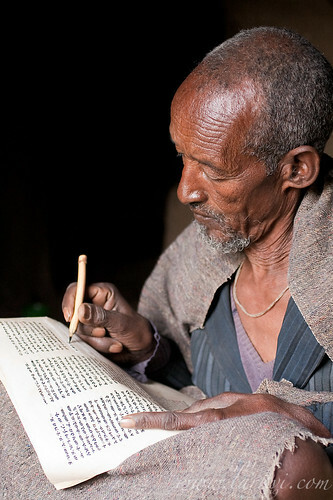 Ethiopian scribes are largely members of the clergy, whether priests (as indicated by the titles Kes, Keshi, Marigeta, Liqa Kahunat) Dabtaras (a liturgical specialist unique to Ethiopian Christianity) or Deacons (Aleka/Haleka/Diacon). Historically, literacy was only taught in church schools, and the ability to read is associated with the clergy. As most written works in Ethiopia are religious in nature, it is not surprising that clergy are the ones who learn to read. In the present day, clusters of scribes are active in-and-around the towns of Axum, Lalibela, and Bahir Dar. Because the written word is believed to have magical power, scribes are also known as magicians and healers, producers of talismans and scrolls of magico-religious healing (talsam, kitab mari). Comments? Questions? Corrections? Suggestions for improvement? Feel free to Contact Me. All content on this website is copyright © Sean M. Winslow 2011- About the Author.